2Prof. Dr., Dünya Göz Hastanesi, Ankara, Türkiye Coherence Tomography (OCT), in addition to the visual fi eld testing became the most important test for both diagnosis and follow up of the glaucoma. 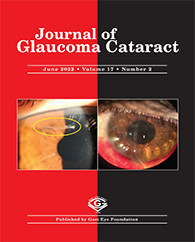 OCT progression analysis became the gold standard for the follow-up of very early and pre-perimetric glaucoma. Progression in green is the newest concept in OCT progression analysis and it became possible to detect and treat glaucomatous damage and progression in very early stages using the progression in green concept.